Posted June 13, 2016 by Tobias Forrest & filed under Episodes. Not one but two characters returned from the dead this season. What trick is Game of Thrones trying to pull on us? As Episode 7 opened with a surprise pre-titles sequence we found a newly revived Sandor Clegane amid a group of rather hapless-looking people. Quite what Brother Ray’s, this week’s guest star Ian McShane, purpose for healing the Hound is we don’t know but I don’t entirely trust the story he told him. ‘If the gods are real, why haven’t they punished me?’ pondered the Hound. It’s unsurprising that the Hound felt more than a little out of place as Brother Ray delivered a sermon to the people under his charge. It’s even less surprising when, in true Game of Thrones fashion, everyone ended up slain and Brother Ray hanged. 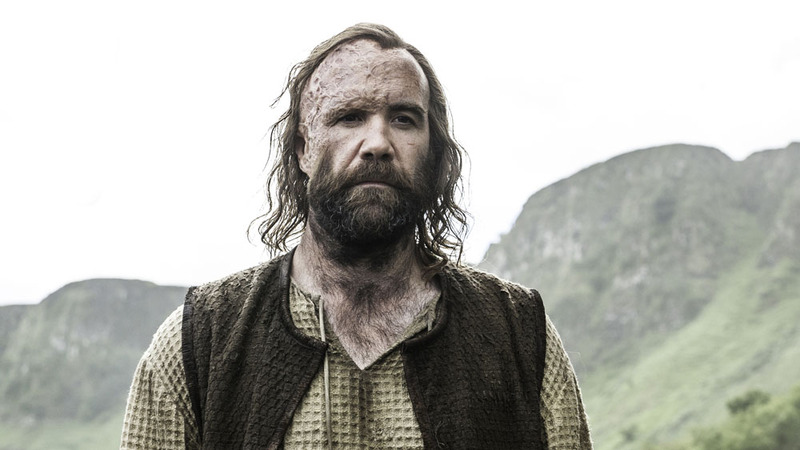 With the Hound now free to go where he pleases what can we expect from him as Season 6 hurtles towards another epic conclusion? Perhaps he’ll stop for some chicken on his way to who knows where? In King’s Landing, the High Sparrow paid a visit to Margaery to question why she hadn’t been in bed with Tommen lately. ‘The King must have an heir,’ he warned. But that wasn’t everything – the High Sparrow also had a warning to deliver about Margaery’s grandmother – the wonderful and ever cantankerous Olenna Tyrell. ‘I fear for her safety, body and soul,’ the High Sparrow informed her in a way that could only intonate a threat. 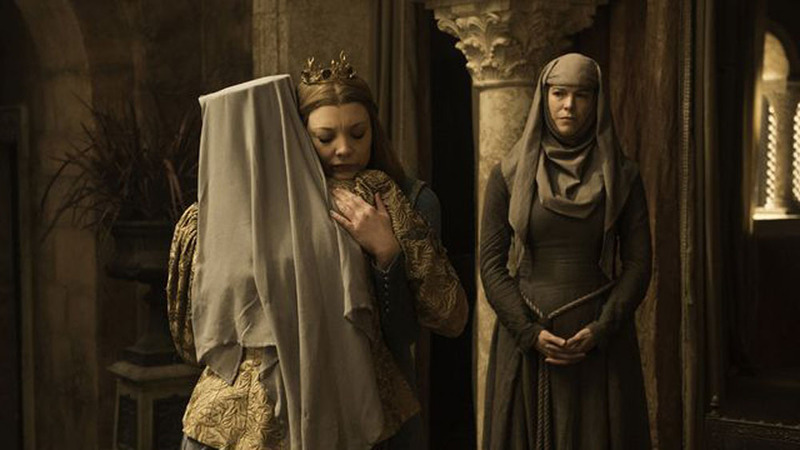 Of course a woman of Olenna’s influence and status is not an easy one to convince and sure enough the Tyrell matriarch objected to Margaery’s pleas. However, the presentation of a note emblazoned with the Tyrell sigil may just have convinced her to leave the capital. If ever you didn’t appreciate what a gift to the series Diana Rigg is fortunately proof was at hand in this episode when Olenna managed to one-up Cersei. ‘I wonder if you’re the worst person I’ve ever met,’ Olenna mused as Cersei attempted to convince her to help in their struggle against the High Sparrow. Except Olenna had no interest in assisting Cersei and said so quite pointedly. There was just one more personal victory for Olenna to claim before the discussion ended. ‘You’ve lost, Cersei. It’s the only joy I can find in all this misery.’ They don’t call her the Queen of Thorns for nothing. Back in the North, Jon and Tormund were able to convince the Wildlings to fight for House Stark against the Bolton’s. But Jon, Sansa and Davos faced an altogether tougher battle on Bear Island against the formidable Lady Mormont – a young girl with a steely hand on her House. It fell to Davos to convince her to rally her men to the Stark’s call. ‘Make no mistake my Lady, the dead are coming.’ Honour-bound by an ancient allegiance, she determined House Mormont could spare 62 fighting men to the cause. It was the best they could hope for in the circumstances. Sadly negotiations did not go quite so well with House Glover whose Lord point-blank refused to honour their allegiance. Even Sansa, with her new determination, was unable to convince the man. Of course this meant that Jon didn’t have near enough the numbers he had been hoping for. Whilst Sansa decided to send a message, Jon believed they should fight with the army they’ve got. Jaime, alongside the much-missed Bronn, arrived in the Riverlands to take charge of the Frey’s siege against the Blackfish. I’ve certainly missed Bronn’s quick wit this series and ‘bromance’ with Jaime. ‘You’re an anointed Knight, there’s quite a difference,’ Jaime told him. ‘Aye, Knights don’t get paid,’ came Bronn’s dry response. When they arrived in the Frey’s camp it was clear their siege was going rather pathetically. As the Frey’s failed to deliver on their fret of executing Edmure, the Blackfish remained quite content to stay in his castle and wait it out. Naturally, it fell to Jaime to bring about some degree of order to the proceedings. First of all this necessitated a parley with the Blackfish. ‘As long as I’m standing the war is not over.’ Negotiations came to an abrupt end leaving the Blackfish feeling even more confident and Jaime more than a little rattled. The Hound wasn’t the only broken man to be healed this week either as Theon’s sister, Yara, forced him to recover his lost strength. ‘I need you, the real Theon Greyjoy,’ she told him. Elsewhere, in Braavos, Arya made a big show of buying passage back to Westeros drawing the attention of the Waif who attacked her as Arya waited on a bridge. 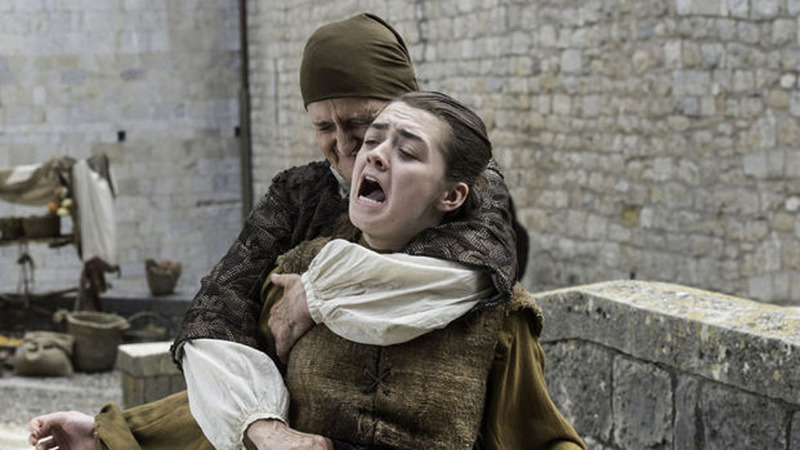 Despite sustaining a nasty stab wound, Arya was able to escape death and stumbled, bleeding, through the street. With all eyes on the young Stark girl, it looks like a final reckoning with the Many-Faced God is at hand. This was quite a disjointed episode, which, in spite of some very good ‘punch-the-air’ moments, often felt as if the most exciting part had come before the titles. All I can say is thank the Seven for Olenna Tyrell. Aired at 9pm on Monday 6 June 2016 on Sky Atlantic. > Buy the complete Season 1-5 box set on Amazon.